Estimation of building materials is essentially required before starting a new construction project. In our previous article, we have already discussed how to calculate cement, sand, and aggregates. Today we will discuss the easiest method to calculate the required number of bricks in a wall. So let’s start from the beginning. 1. Volume of the wall. 2. Volume of a standard brick. 3. Details of openings in the wall. The length of the wall (l) = 10 foot. The height of the wall (h) = 10 foot. Thickness of the wall (b) = 1 foot. Calculate the volume of the wall by multiplying the length, height, and thickness. with the mortar joint, it becomes 200mm × 100 mm× 100 mm. l = 200 mm= 0.656168 ft.
b = 100 mm =0.328084 ft.
h = 100 mm = 0.328084 ft.
3. To find out the total nos of brick divide the volume of wall by the volume of the brick. ∴ No. 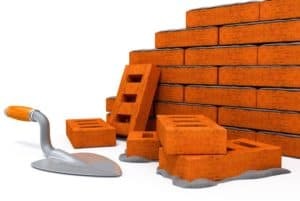 of bricks required = 100/0.0706 = 1416 no. of bricks. Note: 1. Consider 10% wastages of bricks. 2. If the wall has any openings such as doors, windows etc subtract the volume of the openings from the volume of wall and then divide it by the volume of brick. Why dont subtract mortar ? Which is easy to understanding.. Very nyc…….!! & easy for understanding properly.